Did you know that the System databases and objects can be hidden in SQL Server Management Studio? This is not a new feature though. The option to hide system databases and objects was present in SQL Server 2000 as well. 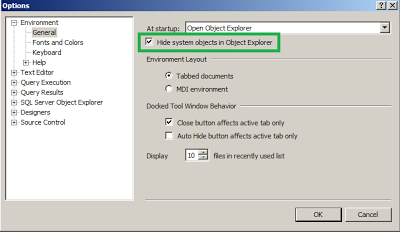 Click "Tools" and Choose "Options"
Expand "Environment" and click on "General"
Select the Check box "Hide System objects in Object Explorer"
Close and reopen the SQL Server Management Studio. Redundant data wastes disk space and creates maintenance problems. If data that exists in more than one place must be changed, the data must be changed in exactly the same way in all locations. For Example, A customer address change is much easier to implement if that data is stored only in the Customers table and nowhere else in the database. What is an "inconsistent dependency"? While it is intuitive for a user to look in the Customers table for the address of a particular customer, it may not make sense to look there for the salary of the employee who calls on that customer. The employee's salary is related to, or dependent on, the employee and thus should be moved to the Employees table. Inconsistent dependencies can make data difficult to access because the path to find the data may be missing or broken. As with many formal rules and specifications, real world scenarios do not always allow for perfect compliance. In general, normalization requires additional tables and some customers find this cumbersome. For example, to track an inventory item that may come from two possible sources, an inventory record may contain fields for Vendor Code 1 and Vendor Code 2. Adhering to the third normal form, while theoretically desirable, is not always practical. If you have a Customers table and you want to eliminate all possible inter-field dependencies, you must create separate tables for cities, ZIP codes, sales representatives, customer classes, and any other factor that may be duplicated in multiple records. However, many small tables may degrade performance. There are multiple color columns. Duplicate records exists or no primary key. This table is now in 1NF. These tables are now in 2NF. The price and tax depends on Items but not on color. These tables are now in 3NF. Tax depends on the Price and not on the primary Key "Item"
Here is a T-SQL Query to list all the files in a folder. This uses a undocumented extended stored procedure to get the details.